Today we have an interview with Dr. Emily (Bennett) George. Dr. George currently practices internal medicine at Summa Health System, she completed her residency at Summa Health System and graduated from NEOMED in 2014 NEOMED. She was the founder of OutReach, the student organization dedicated to serving medically underserved residents of Portage County. Thanks to the burning passion and initial hard work by Dr. George the students of OutReach were able to open SOAR Student Run Free Clinic in September of 2016! Read further to discover how a spark of passion ignited a fire that now provides services to over 40 residents of the greater Portage County area and continues to grow. Talk about OutReach and it’s inception. 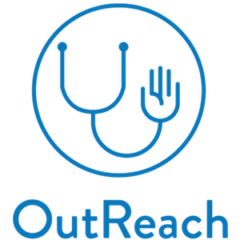 The idea for OutReach started forming when I was volunteering at the Open M Free Clinic in Akron. I volunteered at Open M every other week throughout med school, starting at the front desk and then moving on to see patients my M3 and M4 year. Open M is an outstanding organization. I started researching for free clinics in Portage County and found that there was a lack of resources. There was Townhall 2, which focused more on addiction, violence, and recovery, and the FQHC in Kent. I did a lot of research on the health of the county compared to surrounding counties. I had the opportunity to take a 2 week elective my M3 year in the Community and Family Medicine Department and worked on a project charter and strategic plan. OutReach was officially off the ground in January of 2012! Talk about your experience trying to start a free clinic at NEOMED. Trying to start a free clinic takes a lot of work- even more than I had anticipated. I had the opportunity to go to the Society for Student Run Free Clinic’s annual conference, which really opened my eyes to all that it entailed. I first had to garner student support and identify a group of students who were as passionate about this as I was to help with all of the work involved. I met with multiple people, including the dean, area agencies, and the legal department to discuss barriers and identify barriers I didn’t know yet existed. The three biggest challenges were leveraging partners both at the school and in the community, working through liability, and securing funding. I never succeeded in those before I graduated, but with a lot of hard work, OutReach became a sustainable organization, and the students after me were able to carry it out. What was the feedback at the school? The community? What were the barriers? The feedback from the students and a majority of the faculty was very positive. During my 2 years as a student that OutReach existed, we had over 200 volunteers doing various things. The community partners we met with were very excited to be involved. We were able to get pro-rated labs from Robinson, able to change the route of PARTA so that it came to the med school, and get the word out about an eventual clinic. The biggest barrier we faced was figuring out how to get the clinic started legally. Obviously, with seeing patients, there is some liability involved, and the biggest challenge was figuring out how to minimize it as well as what entity would be responsible for any liabilities assumed. I came to know the legal department very, very well. My goals as a physician are two fold. First, as a physician, I seek to ensure the holistic health of my patients. Health is the absent of disease, be it in the physical body, the mind, or the social context. To truly be a physician, especially a primary care physician, you have to take in to account all of these different aspects and look at the person holistically. For many patients in our area, there is a lack of access to care. People may be far from a physician or have different barriers to care inhibiting them from being seen by a physician. My goal is to reach these patients specifically. The patients that OutReach serves, that Open M serves, that I serve every day in my own office are the people who most need holistic care. My second goal as a physician is to be a teacher. I teach patients, I teach residents, I teach students, and I love it. I am held accountable for my care, my knowledge, and my compassion (or lack there of on occasion). My goal is to be the best teacher and the best physician I can be. What were your thoughts and feelings about the opening of SOAR Student Run Free Clinic? Complete elation! I was so joyful that something I was so passionate about and worked so hard on came to fruition. Would you like to say anything those who pursued the dream of the SRFC at NEOMED? THANK YOU!!!! Thank you for all of your hard work, your passion, and your dedication to the underserved of Portage County. You will touch many, many lives in ways that you won’t realize. What do you hope to ensure that SOAR SRFC embodies? I hope that the clinic continues to work to serve those who are otherwise unable to access care, whether because of a lack of insurance, too high of co-pays, or other hardships. The Hippocratic Oath that we take when we attain our MD or DO states that we are to “remember that there is art to medicine as well as science, and that warmth, sympathy and understanding may outweigh the surgeon’s knife or the chemist’s drug” and we are to treat not a “cancerous growth, but a sick human being, whose illness may affect the person’s family and economic stability.” These actions are always important, but I think they are even more healing when we take care of the marginalized of our society, those who feel shunned secondary to race, socioeconomic status, or stigmatized diseases. Any words of advice for the SOAR SRFC volunteers? Keep up the good work. Don’t be afraid to ask for help. Leverage community partners. When you are out in residency and practice, remember your roots. This is the time in life when you will be the least cynical. When life creeps up on you and you are exhausted from pulling a 28 hour shift and working 80 hours a week for years, remember the people you care for. Think of their lives, their struggles, their barriers. Treat them as humans. Treat them as family. You will be surprised how much this will heal someone. Thank you so much Dr. George for your hard work, dedication, and continued passion for creating healthy communities in Northeast Ohio! We are very lucky to have you as one of our alumni and look forward to all the incredible improvements you will bring to our region. You are an inspiration to your peers and future physicians!